On a lightly floured surface, roll 1 dough disk into a 12 inch circle, about 1/8 inch thick. Transfer to a 9 inch deep dish pie dish, lettin gdough fall into place. Trim edges to ¼ inch past rim of pie dish, cover with plastic wrap, and refrigerate for 30 minutes. Roll out remaining dough disk into an 11 inch circle,a bout 1/8 inch thick. Cut into 12 (3/4 inch) strips. Transfer to a baking sheet, cover with plastic wrap, and refrigerate for 15 minutes. Prick bottom and sides of refrigerated pie dough with a fork. Bake until edges are plae. 12 to 16 minutes. 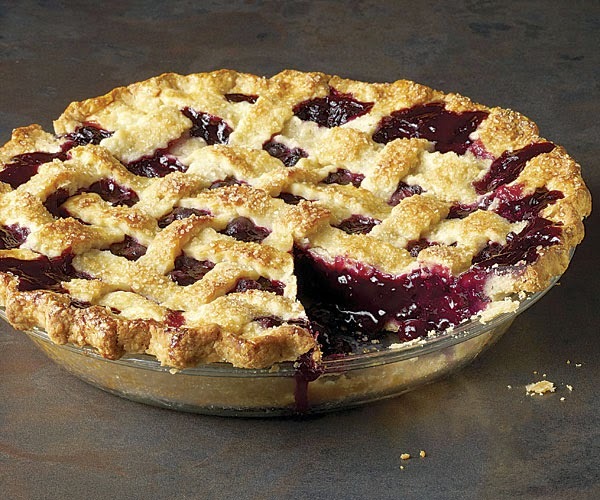 In a large stockpot ove rmedium heat, combine blueberries and ½ cup sugar. Cook, stirring occasionally, until most baerries pop, 8 to 12 minutes. Strain blueberries through a fine mesh sieve, set ovewr a bowl, for 5 minutes. Reserving juice. In a medium bowl, whisk together 1 cup reserved bluebery juice, ½ cup sugar, tapioca flour, and salt. Add blueberries to juice mixture, stirring gently to combine pour blueberries into prepared crust. Lay 6 dough strips vertically over pie, suing longer strips in center and shorter ones on sides. Fold back every other strip to its medway point. Place a new strip horizontally over unfolded strips. Unfold vertical strips, crossing horizontal one. Then fold back alternate strips, and place another horizontal strip parallel to first one. Continue weaving in this fashion until you have 3 horizontal strips on this half of pie in the same fashion. Bursh dough strips with cream, and sprinkle with remaining 2 tblespoons sugar. Place pie on rimmed baking sheet. Bake until filling is bubbly and crust is golden, about 1 hour. Transfer to a wire rakc, and let cool for at least 3 hours before serving. Tips: if the edges of the crust begin to brown too much before filling is bubbly, wrap edges in strips of aluminum foil.